Why do we live the RV lifestyle? Many folks say that it is the best way to spend quality time with the family, create strong bonds with their children, and to maintain lasting relationships with their spouse. The staff and management at the Victorian RV Park understand the importance of these factors and strive to offer the best environment for you and your travel companions. Our staff genuinely cares about the well being of our guests and we do our best to offer you a great experience while visiting our RV Park. Join us for an event or just for a weekend getaway and you will become a return customer. 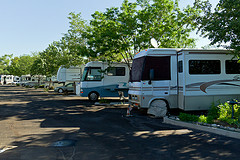 The Victorian RV Park staff will assist you in having a great stay regardless of the type of fun you feel is appealing. • Truckee River– A river that rushes down from the Sierras from Lake Tahoe to Pyramid Lake through the heart of Reno and Sparks with excellent fishing and is a great place to ride the rapids or have a BBQ. Feel like floating down the river? The Truckee River offers some excellent adventure opportunities for you and your family to go with the flow. • Beautiful Lake Tahoe– One of the clearest and deepest alpine lakes on the planet with great beaches, dining, casinos and numerous recreational opportunities including skiing, snowboarding, snowshoeing, and hiking. If you would like to spend a day at the beach, Tahoe is the best place to soak up some rays. • Historic Virginia City– A “living ghost town” home of the Comstock Lode, Mark Twain, and the Wild West. A short 30 minutes away from Reno, Virginia City offers you and your family the opportunity to step back in time. Head up there for some old fashioned pictures with your loved ones, peruse the many gift shops or boot hill cemetery, and grab your favorite libation at the Bucket of Blood Saloon that has been in operation since 1875. If you are coming to the area for the Street Vibrations Motorcycle Rally, you have to head up to Virginia City! Trust us, you will not be disappointed!!! • Pyramid Lake– A mysterious desert lake known for their monster sized trout and unique rock formations. The record for the largest cutthroat trout set at Pyramid Lake was a 41 pounder. Think you can beat it? We compel you to try! These monsters seem to like the rainbow or red colored spoons (lures). Most days you can catch between 5 and 10 pounders right from the shore. If you are a fisherman visiting Reno Sparks then this is an opportunity that you do not want to miss! This will be a great bonding experience for you and your companions. • Boca/Stampede Reservoirs– Beautiful alpine lakes with great opportunities to fish or to just soak up the beautiful scenery. The town of Boca originally began in 1868 as a place to harvest ice that was transported on the railway going through Truckee, California to locations across the country. There was a sawmill and brewery that produced 30,000 gallons of beer annually with enough popularity to be featured in the World’s Fair in Paris, France circa 1883. The remnants of the town are long gone but the 180 acre mill pond still remains. If you have an off-road vehicle, there are some great logging roads to explore out near Boca. If you have the opportunity, take the 30 mile trip from Reno and go explore the lakes in the area and try your hand at catching a kokanee salmon, brown or rainbow trout. • Historic Truckee– A classic sierra town with a row of old shops and eateries that will give you a taste of mountain living. The town was named after a Paiute guide that helped people migrate over the Sierras on their way to California. • Donner Lake– Named after the Donner Party, a group that was forced into cannibalism to survive the harsh winter, Donner Lake is a chilly lake nestled in the Sierras with beautiful scenery, but you may not want to stop for a “bite” there. • Historic Genoa– Founded in 1851, Genoa began as an outpost for emigrants making their way to California. This is a beautiful place at the base of the Sierras just past Carson City. The town has become a popular stop for motorcycle riders and tourists looking to have a drink at Nevada’s oldest thirst parlor the Genoa Bar founded in 1853. Give us the opportunity to host you for your next RVing adventure in Northern Nevada and we can guarantee you the time of your life! Call us today to book your reservation. There are many ways one can have fun in Reno Sparks. If your type of fun is gambling, sightseeing, attending a special event, or eating some great local cuisine, the staff at the Victorian RV Park will be able to point you in the right direction. 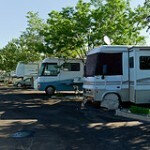 At the Victorian RV Park, we value our guests and strive to provide the finest RV accommodations in Northern Nevada. Come stay with us on your next adventure! The Victorian RV Park is "hidden in plain sight" right near the heart of Sparks. We are located within walking distance to all of the great events hosted in Downtown Sparks. Are you interested in Hot August Nights, the Best in the West Nugget Rib Cook Off, or Street Vibrations? Stay with us and enjoy all that Reno Sparks has to offer! At the Victorian RV Park we care about our community. In an effort to support the aquatic environment and reduce the effects of illegal RV dumping at the jewel of Northern Nevada, Pyramid Lake, the Victorian RV Park is offering free dump service for RV owners that present a valid tribal permit for day use or camping. We are excited to offer housing for Tesla employees and contractors who will be working on the new Tesla plant just outside of Sparks! We will be offering great group rates for the staff members that need a nice place to stay during the construction phase! Blood Drive this Friday August 23, 2013. So far this year we have saved over 86 lives through the donations made by our guests. Thank you for your support with our community outreach programs! The Grand Re-Opening party was a great success! Thank you to all of our guests and vendors that came together to make this an event to remember! The party went off without a hitch at our fabulous new BBQ area! We had a successful blood drive thanks to the donations of our guests. The whole hog that was smoked for 16 hours came out amazing thanks to our staff that pulled an all nighter to make it happen! We also brought in a good amount of food for the Evelyn Mount Foundation that helps families in need in Northern Nevada. Thank you for your support for our community outreach programs! We couldn't do it without the support of our guests and staff! We have had a couple of successful blood drives thanks to the donations of our guests. Thank you for your support! Check back for updates on our community activities.